Your garden and backyard are meant to be enjoyed. A well-kept garden can be a relaxing or invigorating place to sit or stroll through. When looking for the right structure to provide shade, it’s not always a matter of using a table umbrella or a gazebo. If you are after a custom, durable element, then consider installing a pergola on your deck or along a yard pathway. Pergola designs can be as simple or elegant as you desire and are the perfect way to add a personal touch to your yard. When accompanied with climbing plants or vines, a pergola offers a unique feature that can be blended with your existing garden design or used to accentuate it. Having the right kind of pergola installed can create a backyard oasis perfect for unwinding. By hiring an experienced pergola contractor, you will benefit from unparalleled skill and care of design in achieving your fully realized yard. 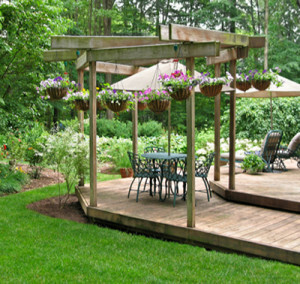 Having a pergola installed on your deck or in your yard comes with several advantages. Whether you are searching for a way to improve the value of your home, want a shelter to relax in, or are seeking a creative way to beautify your yard, a pergola is a wonderful option. Improved value: A pergola of any design is a valued addition to any yard. As any real estate agent will tell you, pergolas can improve the value of your property and increase the prestige of your home through their visual appeal. Protection: A pergola offers a respite of shade on a hot, sunny day and provides protection from inclement weather. If adorned with the right vines and climbing plants, your pergola can be a uniquely styled sanctuary against the elements and enable you to enjoy your garden—rain or shine. Blocks unsightly views: Some yards have a few features that can impede an enjoyable view. A neighbouring home or garden may be unkempt, or you could have a property that looks out onto a dirty ravine or street. Establishing a pergola on your deck or in the yard can draw the eye away from or block these unpleasant views. Total Fence Inc.’s expert pergola contractors are the best in the Toronto area and can offer unparalleled design options for your projects. Whether you are looking for a low-budget option like wood lattice to combine with climbing plants and vines, or are seeking the sustainable chic look of bamboo, trust the experts at Total Fence Inc. Perhaps you are after a pergola design that can blend with the natural landscape? If so, we recommend brushwood’s rustic appeal. And if you’re looking for a more modern style, consider using finished or raw lumber for a bolder look and a solid structure that is built to support additional features. No matter your tastes, we have the skill and supplies to build your perfect pergola. Click here to learn more about how Total Fence Inc.’s skilled pergola contractors can design, build, and install the perfect pergola for your Toronto home. Alternatively, to make an appointment for a consultation or for a free quotation, contact us today.